Shards in Elastic Search- When we have a large number of documents, we may come to a point where a single node may not be enough—for example, because of RAM limitations, hard disk capacity, insufficient processing power, and inability to respond to client requests fast enough. In such a case, data can be divided into smaller parts called shards (where each shard is a separate Apache Lucene index). Each shard can be placed on a different server, and thus, your data can be spread among the cluster nodes. When you query an index that is built from multiple shards, Elasticsearch sends the query to each relevant shard and merges the result in such a way that your application doesn’t know about the shards. In addition to this, having multiple shards can speed up the indexing. clustering allows us to store information volumes that exceed abilities of a single server. To achieve this requirement, ElasticSearch spread data to several physical Lucene indices. Those Lucene indices are called shards and the process of this spreading is called sharding. ElasticSearch can do this automatically and all parts of the index (shards) are visible to the user as one-big index. Note that besides this automation, it is crucial to tune this mechanism for particular use case because the number of shard index is built or is configured during index creation and cannot be changed later, at least currently. That’s a little of the “infinite scaling magic ” because each machine in your cluster only have to deal with some pieces of your data. In order to increase query throughput or achieve high availability, shard replicas can be used. A replica is just an exact copy of the shard, and each shard can have zero or more replicas. In other words, Elasticsearch can have many identical shards and one of them is automatically chosen as a place where the operations that change the index are directed. This special shard is called a primary shard, and the others are called replica shards. When the primary shard is lost (for example, a server holding the shard data is unavailable), the cluster will promote the replica to be the new primary shard. Sharing allows us to push more data into ElasticSearch that is possible for a single node to handle. Replicas can help where load increases and a single node is not able to handle all the requests. The idea is simple: create additional copy of a shard, which can be used for queries just as original, primary shard. Note that we get safety for free. If the server with the shard is gone, ElasticSearch can use replica and no data is lost. Replicas can be added and removed at any time, so you can adjust their numbers when needed..
WHAT HAPPENS WHEN YOU SEARCH AN INDEX? When you search an index, Elasticsearch has to look in a complete set of shards for that index Those shards can be either primary or replicas because primary and replica shards typically contain the same documents. 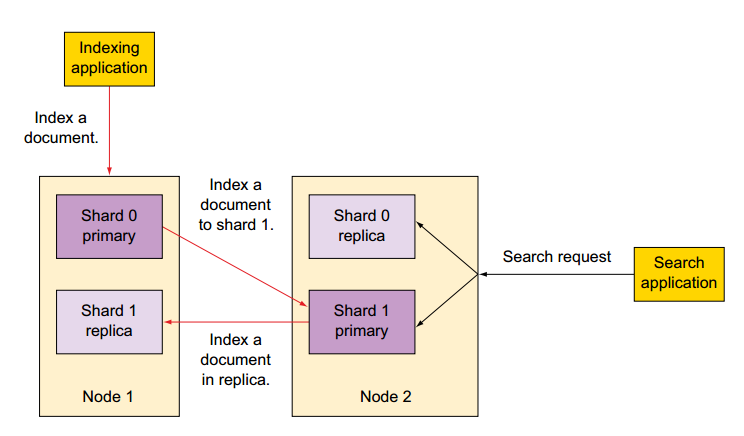 Elasticsearch distributes the search load between the primary and replica shards of the index you’re searching, making replicas useful for both search performance and fault tolerance. Next we’ll look at the details of what primary and replica shards are and how they’re allocated in an Elasticsearch cluster.